What is the best shopping cart? If you try to ask this question on some forum or newsgroup, you will surely get many replies. Everyone will present you his favorite. My first developed online store was created with standard osCommerce platform. After three or four projects, I started to work with CRE Loaded and used it frequently for years. Although it was also an osCommerce fork, it had many advantages. I switched to Magento™ early this year and this is my final choice. Let’s look at the popularity of those platforms now. As you can see, osCommerce still remains the most popular eCommerce platform. However, you can notice that this popularity is fading. ZenCart is stable for the past two years. And my previous favorite, CRE Loaded (much better solution than ZenCart in my opinion), is very low. Its popularity is also fading even after their team put great effort into a new website and identity. @Toni, Fully agree. Sure the number of osCommerce installs would certainly dwarf the number of Magento installs. But I suspect the revenue of that much smaller number of Magento installs would be greater than the combined osCommerce revenue. I’ve worked on 3 magento projects in the past 12 months and all are doing *well* into the millions in annual revenue. That’s really not that much for a shop, online or offline. Think of any local shop – after rent, wages, cost of goods, insurance, etc, many of them would be doing over a million in revenue. osCommerce, and this article as well. Has the thought ever crossed your mind that PART of the reason they don’t have that budget is the fact they are using outdated software? We’ve used and continue to use Oscommerce for e-commerce website solutions, whilst I have demo versions of zen and magento I do find it impossible to believe there is a better solution for all! Every website need is different and more importanlty every business has a different budget. Magento enterprise at 12k a year, hello, how many of all websites trading online has this kind of budget. So it was hard to reach another conclusion. Hello Mark and tank you for the comment. However, there was never an ambition to present this blog article as serious research. It just touches the question about popularity. Sloppy research that answers one question: which is the most searched for product? The most searched for certainly doesn’t mean the best. Nor does it mean the most popular – osCommerce has had years and years to build up an install base which almost certainly dwards magento’s. Also, magento requires more serious development and so cuts out many low end shops which, by numbers, are the most common. That this has been passed for serious research is fairly comical. Comments like “Analysis is quite perfect.” are funny! How do you manage the taxes in Magento? I mean how do you apply the discounts.. Any tips? Thanks for the reply guys! Sorry, I was banking on an email update when someone got back to me.. No go I guess. I prefer Avactis shopping cart, it is easy to upgrade, SEO friendly, good support.. I integrated it with my site very easily (it is possible to integrate it to the current design, using the tags of the shopping cart elements).. I save several thousand dollars on design integration! Free version has multy-store functionality. Are you able to manage multiple sites with Magento using the free version or do you have to purchase the enterprise version? As far as improvements (or lack thereof) of Zen Cart are concerned, there is ZenMagick, a add-on (if you will) that replaces the storefront code with a new MVC based templating system. It also includes a OO database API (a simple OR interface), a flexible plugin architecture (no core file changes any more!) and more. There is even a plugin to use Smarty. There is a demo store (http://demo.zenmagick.org/) with Ajax, some free features and options to compare ZenMagick and the vanilla Zen Cart templates. If you want high end functionaliyt Magento Commerce is the best choice. Zen cart is better than OS commerce. Which is best really depends on the needs of the user. osCommerce has and continues to serve many users quite adequately, while other have found CRE, Zen Cart and now Magento more suitable to their own needs. As developers, we found the lack of progress with osCommerce disheartening and after evaluating Magento and finding it overly complex and resource hungry we decide to develop our own cart “Suocommerce” and have used this since early 2007 on client sites. We think this cart will fit nicely between the overkill of Magento and the lack of development progress with osCommerce. 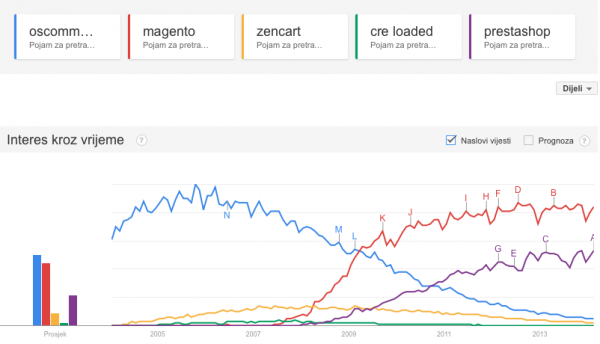 I agree, Magento will be king of the carts. The best feature that I like about it is the multiple storefront on different domains – this is a Godsend to a company like mine, where we want to operate several sites but trade under one name – fantastic for producing reports, finding a new niché, rolling out company wide pricing changes… I love it. Graph is copied from Google Trends. Please click on this link to see it in action. You can also add your keywords there. Wonderful analysis. OsCommerce is very nice, but a pain in the @ss to fit specific client needs sometimes. I believe your graph is using the old version of OsCommerce.